I have just bought 5383 and she looks very similar. . .I need lots of info to help me restore her. Who do I talk to please? Congratulations. Have you a photo you can upload? 5383 lying in a barn in Ireland. Hello. . .this is a better pic now she has come home. I really need to know what kind of timber was specified in the construction. It is a light weight and a reddish colour. . could it be Meranti, or Niangan ? Sorry but i can't seem to upload the picture. Too large. . . I will when I can. . however I really need to know what type of timber was specified for their construction. It is of light weight and redd in colour. .would it be Meranti or Niangan possibly ? Early BPB craft specified and used African mahogany I believe. I may well be corrected on this but the 63' Whalebacks certainly did as did some Seaplane tenders. What length is she? Which engine has she got fitted. African Mahogany - Khaya Ivorensis. ..but from the picture she looks to be in better shape than many of the projects being carried out. I saved a planing dinghy in Scotland and then it went down to Southampton with Phil Clabburn. My understanding is that the BMPT then assumed ownership and gave it to someone else, but I am not sure. Maybe Pioneer knows it's whereabouts now. I think that Phil might have had a drawing or two at one stage. I do not not know what happened to the dingy - but I shall ask around. 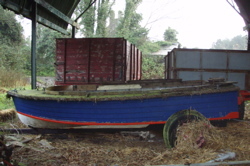 The planing dingy is a different hull from to the FMD. Plans are under way, time permitting from BMPT. For boats numbers 5004 and 5383, are they FMDs or are they PDs? What number was the planing dinghy?